This handbook outlines a set of practical measures designed to counter corruption in the organization and staging of major public events, guided by the principles of UNCAC. The publication also features the Corruption Prevention Checklist, a self-administered, anti-corruption tool to help organizers of major public events undertake a comprehensive strategic risk assessment when planning the event. UNODC engaged with the OECD and the World Bank to compile guidelines and related material on private sector anti-corruption compliance into one easy-to-use publication. The handbook outlines principles from major organizations and complements them with anonymous, real-world cases. This publication aims to inform states of global good practices in strengthening corporate integrity though the use of incentives and sanctions, which can be used to promote a culture of integrity. This publication serves as a reference material for governments, international organizations, the private sector, academia and civil society, by providing an overview of good practices in ensuring compliance with article 9 of UNCAC. 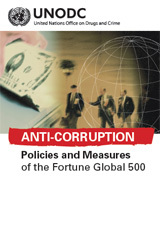 UNODC and PricewaterhouseCoopers developed a compendium of what companies in the Fortune 500 Global Index (2008) are doing to fight corruption, highlighting a range of measures and different approaches. Volume 1 of the study provides an overview of the obstacles small- and medium-sized enterprises (SME) face when dealing with public and private sector corruption. Volume 2 of the study contains a set of recommendations and tools that practitioners can use to support smaller enterprises in their efforts to fight corruption in their business environment and to promote good governance. UNODC is a global leader in the fight against illicit drugs and international crime. It has been give the responsibility to help translate UNCAC into action. To mark the International Anti-Corruption Day, on 9 December, in a joint effort between UNODC and the United Nations Development Program (UNDP), this site focuses on how corruption hinders efforts to achieve the internationally agreed upon Millennium Development Goals and impacts education, health, justice, democracy, prosperity and development. The study prepared by the StAR Initiative of the World Bank and UNODC aims to support countries’ efforts to meet international standards that were developed in recent years to help combat financial crime and provides a good outline of international standards with regard to the issue of beneficial ownership.